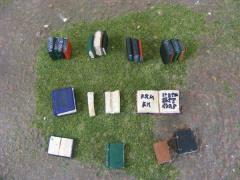 A set of books and scrolls in 28mm scale. Perfect for a wizard's study or a library. This set contains 4 stacks of books, 4 individual books, 2 open books, and 2 scrolls for a total of 12 pieces.